Apparently he was floating in what appeared to be a void of nothing but black at first. Somehow his limbs were not responding to his commands. While he had expected this, at the same time Cade had not. The Omniverse he was going to be in was much different from the one he actually knew and wished was this one. And then a smiling white biped materialized who launched into a very familiar, and annoying spiel. Unlike his father Warren, Cade did not desire to do numerous things that were sadistically cruel to the individual. However, he did wish that Omni would stop abducting people against their will. Giving them a choice to be brought here would be better, like the Omni of the Omniverse he was from did. Choice was essential, and it seemed he was not going to get freedom of choice. And then he was told about Omnilium by the smiling white biped. Oh wait, he already knew about the substance. His aggravation with the individual continued rising when he was told about the substance once more. As the spiel about the others, Primes began, Cade had to resist the urge to wish to take furniture and break it over the head of Omni. Just how cliche was Omni going to get? He already knew all of this. Once the "conversation" had been done, he was in the blinding white of the Nexus. Granted he was less than happy about being dragged into the insanity Omni was creating - all over again. At least Warren had seen to it he would be properly equipped for the mission which was to give this Omni a whupping that he so righteously deserved. Truth be told, Salde didn't know what to make of the situation; Otomo had finally captured him, but... he wasn't dragging him back to the castle like he expected. Instead, the butler had offered to accompany him on his travels. If it had been anyone else, the prince would've been suspicious, but Otomo wasn't exactly one to plan out something like that. Not that he was dumb, but deception was not in his nature. So what could Shellbrick do but bring his trusty servant along? A fading sunset peeked through the orange treetops, bathing everything in a warm golden, light. The dolphin held on tight to the neck of his servant as he trekked through a forest, leaves consistently crinkling underneath. Salde hummed contentedly and swished his tail about, resting his head on his blonde servant's shoulder and watching for a perfect camping spot. "Halt!" The wayward royal pointed at a stream not too far away from where they were standing. "We shall camp there!" Otomo nodded and picked up the pace, arriving at the brook in mere seconds. Once they were at their destination, Salde bounded from his butler's back, twirled in the air, and landed into the babbling creek with barely a splash. He breached the surface and turned to glance at his lesser, who was clapping politely at the display; the servant probably would've been holding up a sign that read "10" if he had one, the prince mused. "Okay, okay, enough of that." The silence returned for a moment as the servant let his arms fall to his sides. "Now! The tent shall be over here." He waved a fin towards a bend in the stream. "Thou shalt set it up there, and gather wood for our fire whilst I gather food for us." And without waiting for Otomo's confirmation, he ducked back under the surface and sped away. His sleek form darted about in the water, his fins tucked behind him. There wouldn't be any fish in the brook, but he knew that this had to drain into a lake or an ocean, and there he would go. It took him several minutes, but eventually, the creek began to widen out, and soon the entirety of a lake lay before him (he could sense that the liquid around him wasn't salty). Salde dove further into the deep, the light dying out behind him. Even still, his trained senses didn't require light to help him move about; he focused on the water pressing against his soft, pink skin, and how it waved over his entire body-- after all, something had to have moved the liquid, and what else could've done so but other fish? An increase in pressure on his right side alerted him to a possible prey, and he turned on a dime to dash in that direction. The royal dolphin barreled through the lake like a torpedo, leaving bubbles in his wake. Now that he was drawing closer, he could smell his target: a bass almost as big as he was, floating aimlessly in the open. Shellbrick opened wide, allowing his pointy teeth to unsheathe as he raced towards his next meal. The fish noticed a moment too late, and while it turned to flee, the dolphin clamped his maw down onto its tail. His prey flailed as his teeth pierced its scales, staining the water a murky red. He tugged and tugged, raking through his target's body until it finally stopped struggling. A messy kill, but it would do. He slowly dragged it back to camp, allowing the blood to drain as they floated along. By the time he had arrived with his catch, the sun had already set. Otomo sat by the fire, staring down the end of the stream that Salde has dashed through. As the dolphin drew closer, his servant perked up and waved him down. "Ah, Prince! Welcome back!" In response, the royal fish tossed his prey onto the land, causing his butler to scuttle back in surprise. He breached the water in turn. "Indeed I am! Now get this cooking." Otomo glanced down at the mangled bass in front of him. "...Are you sure this is edible?" "Of course it is!" The dolphin tossed his fins up in annoyance. "It might not be professionally cut, but thou canst eat it just fine! Now get it on the fire!" "O-of course." His servant bowed and grabbed the fish where he could. He began to debone it, humming to himself, before eventually mounting it onto the fire with a metal pan to hold it. The prince hopped back into the brook, resting underneath the surface and waiting for his meal to finish cooking. The meal passed by uneventfully, and soon they retired to sleep. Prince Salde had originally slept in the creek while Otomo slept in the tent, but after a few minutes, the dolphin decided that he would rather cuddle with his butler than fall asleep alone in the stream. He crawled onto dry land, shook himself dry, and waddled into the tent. His lesser had already fallen unconscious, so he contented himself to scamper onto the blonde's chest, curl up, and conk out in the next few seconds. But when he awoke, he was met with darkness. Darkness to the left of him, darkness to his right, darkness above and below him. It was as if the world had suddenly vanished. "Otomo! Where art thou?" he shouted into the abyss. ...At least that's what he would've said, had his vocal cords not suddenly decided to stop cooperating. And the rest of his body too-- the dolphin found himself unable to move at all, curled into a ball in the midst of the black. If he could make the tiniest movement, he would've begun to shiver. It wouldn't have been out of cold (this place literally felt like nothing to him), but out of fear. Where was the world? Where were the others? Had the apocalypse stormed through while he was resting? A white speck in the horizon caught Salde's attention, although he couldn't really move his eyes anyway, so all he could do was wait as the mysterious being drew closer from just within his field of vision. Once the creature was up close, it leaned over so its face was in full view. It was humanoid in appearance, but stark white, and the only feature it had was a massive grin plastered across its face. The fish wanted to scream out at the stranger in front of him, but he was utterly paralyzed, leaving him to wait, helpless against the being before him. Quote: "My name is Omni. This is not the world you know. This is the Omniverse. You interest me, so I have made you part of it. The Omniverse is a place that reflects the wishes of those who are part of it. But! There are rules. I will explain them only once, so listen carefully." Quote: Omni hands you a glimmering orb in which all the colors of the rainbow coalesce. "This is Omnilium. It's what ties the Omniverse together. Without it, you are nothing. With it, anything you desire can be yours. But you will need more than this. If you desire it enough, you will find it. You will find that using it comes naturally. Just think of what you desire most." All of his thoughts froze when he witnessed the floating sphere in front of him, sparkling in countless ways. He could do anything he wanted with this? That wasn't something he could do back home! His tail would've been wagging if could move, but he couldn't, so he just watched as the orb floated off and nestled itself in the open space between him like a pearl hidden within a clam. Quote: "You will not be alone in the Omniverse. There are others. Of course, they, too desire Omnilium. Do not fear death. For as long as you interest me, you will be reborn. That's all you need to know right now. You'll figure out the rest soon enough. I'll be watching … and waiting." And with that, Shellbrick could blink, and when he opened his eyes again, the darkness was replaced with the deep blue of the ocean. A ring of light shone down from above, directly glowing onto the puzzled fish as he tested his body to confirm that he could move again. He wrapped his tail around the glowing Omnilium once more, looking at it in awe as the array of colors reflected off of the water and surrounded him in an iridescent sheen. He remained like that for several minutes, enthralled by the display until he grew bored of sitting at the bottom of the little ocean he had been dropped in. Allowing the orb to fuse with him, he burst from the sandy floor and raced towards the light, breaching the surface by a good 20 feet and landing back in the water with a mighty splash. He poked his head out of the liquid, scanning the blank horizon before him while somehow remaining completely unaware of the poor sap who was now soaking wet. Dripping what he could only hope was H20 and not any sort of chemical agent, or anything Cade decided on something. His first order of business was going to be new clothes when he had the opportunity to acquire them. Immediately following new clothing was something else that he drastically needed in this place, a shelter. Some sort of house or base would be ideal but he could make do with a tenement or a tent if he absolutely had to do so. "What was with splashing me?" asked Cade looking at the individual who had done so. The individual appeared to be some sort of aquatic life form. Either way, he had not appreciated suddenly finding his ONLY, and yes only set of clothes he had at present drenched right to the underwear. His next outfit was most certainly going to be water proofed. Cade was not smiling at the individual as he discussed the reason behind his current condition. "You don't just do that to people!" Cade roared out as he mentally went through and checked what supplies he had. Other than the clothes on his back, he had nothing. "What was with splashing me?" The sudden voice caught the dolphin off-guard, and he twirled around in the water to face the stranger. As he expected from the question, the man in front of him was soaked thoroughly. His white hair clumped to his face, and Salde could see the purple eyes glaring at him between the pale strands. "Ah, salutations, stranger!" The royal fish adjusted his crown and preened his fins while talking with the newcomer. "T'was not intentional. Thou wast too close to the fountain when I breached the water to enter this mysterious realm." "You don't just do that to people!" the man in black-and-gold armor huffed, turning to examine his person. Shellbrick crossed his fins and frowned. "Again, t'was not done intentionally. If thou didst not want to be soaked, then keep away from the water. I simply didst not notice thine presence." "It's not everyday some random fish pops out of the fountain and ruins people's clothing, y'know?" "Random fish?" The runaway prince narrowed his blue eyes and floated over to the edge of the water. How dare this peasant call him something so plebian?! "I'll have you know that I am no ordinary fish! I am Prince Salde Shellbrick III, Prince of the Ocean!" The man stared at him, totally nonplussed. "Titles mean nothing here. But if we're introducing ourselves, I might as well give you my name. I'm Cade Zimmer, and I came from a world parallel from this one." Right. This wasn't his world; the Shellbrick name held no power here. Feelings of annoyance and excitement rushed through his mind as he determined what he would do about this in due time. Did he want to establish the Shellbrick name? Did he want to roam free? At first, he figured the choice would be obvious-- after living a strangling, royal life, he had been dropped into a universe filled with infinite possibilities. He'd obviously want to explore his newfound freedom, right? But the longer he thought about it, the more he realized that he would miss having some sort of power to flex. In the end, he'd suppose he'd start by making a few connections, starting with the guy in front of him. As much as he knew it was his fault he got wet, he decided that it was in his best interest to try and get on his good side. "Greetings, Cade." His voice was faintly strained from hiding his contempt for the other. "I suppose thou wouldst desire dry clothes now." Without another word, he mentally focused on the damp clothes in front of him, steadily straining out the liquid and merging it all together into an orb hovering in the air. With a flick of his fin, he sent the sphere of water back into the fountain without so much as a splash. "There. Is that better?" "It is certainly better than being drenched," admitted Cade. Cade then looked at him for a moment. "Some sort of Hydromancer likely. Impressive work. I'll have to study how you pulled that off, and build a device that does similarly." Cade then examined the orb of Omnilium he possessed. If the orb could do what he desired, then perhaps maybe... it could recreate his dad's NFL-R. In the long run he was going to need some equipment for himself to survive in this place. Not all the Primes were likely going to be any definition of the word "nice" to him. At least this one had not proven to be hostile towards him. "How does one work this orb?" asked Cade attempting to make the orb of Omnilium create an NFL-R for him. Yet it didn't work, because Cade didn't have the right knowledge of the NFL-R. Sure he knew how it worked back home, but here it was different. "And let me guess. You've met Omni as well? I have, and I dislike him. Both the iteration here, and the one I met back home. Extremely so, in fact." muttered Cade as he examined their surroundings. The shining white was irritating on his eyes. A set of sunglasses were made by him, and put on as soon as he figured out how the Omnilium worked. Salde beamed at what he interpreted as Cade's praise, hopping onto the rim of the fountain and splaying his fins out in a grand display. 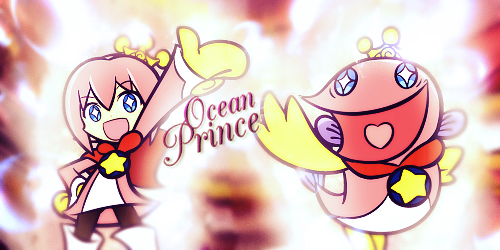 "T'is an easy thing for the sea's royalty! Thou thinkest thou canst learn it as well?" With a chuckle, he dropped down to the floor and glanced up at his new friend from just above his kneecaps before examining him up and down. "Perhaps. Thou doth not look like one who is capable of it. No scales, no fins, no gills! To manipulate the sea, thou must be one with the sea! If thou hadst a form like mine..."
Suddenly an idea floated to the forefront of his mind. "Perhaps I can givest thou a form like mine! Allow me a few minutes to figure this Omnilium out." He turned and brought his iridescent orb into being, holding it with his fins. Now, how would he work this? It wouldn't bend to his touch, so how was he going to mold it into the Star Lantern? At that thought, he noticed a silhouette of the artifact within the center of the bubble. Oh, so that works! He concentrated on the treasure, trying to recall its every detail. It wasn't much, but after several minutes of deliberation, he soon had the rusty, blue lantern in his hold. It glowed faintly from an indiscernible source in its center, bathing the two Primes in a deep blue light. "Behold! The Star Lantern!" He waited for a moment for Cade's response, then realized that he was busy with his own Omnilium. He peeked into the floating orb, but the image inside wasn't anything he recognized. With a sigh, the human closed his arms around the sphere and looked down at the pink dolphin before him. "How does one work this orb?" he asked. "I see you understand how it works unless you've always had that lantern." "Thou must focus on every detail! Once thou hast a clear picture of thine summon, it shall appear!" Shellbrick waved the artifact around a bit. "For example, the Star Lantern. I had to recall the texture, the size, the material! But that wasn't enough-- I needed to remember what this was capable of! And every detail of that! After all, this is what allows me to keep mine aquatic form." "So you're not usually a dolphin?" "I suppose not. But for now, I have no reason to keep this form; there is little water around here and I don't want to dry up. So if thou wantest, I canst give thou a demonstration!" "Might as well-- if I can figure out how that works, I might be able to get the hang of your hydrokinesis." "Very well! Watch in awe as the sea's light returns me to mine true form!" Salde raised the lantern above his head and shook it. It rang like a bell, and upon the third ring, a blinding light flashed and blinded the other Prime. Cade yelped and rubbed his eyes, and when he could see again, there was no longer a dolphin, but rather a child standing in his place. It was easy to tell that the kid was Shellbrick-- the pink hair, the blue eyes with the weird, star-shaped, white pupils, the yellow mittens, and of course, the crown. He chuckled and lowered the treasure. "And there it is!" "Fascinating... And let me guess. You've met Omni as well? I have, and I dislike him. Both the iteration here, and the one I met back home. Extremely so, in fact." "Omni is that white silhouette, right?" "I have. Thou seems to hold a grudge against him. I must say I disagree with thine opinion-- he hast freed me from mine droll existence and dropped me into a realm of countless possibilities. Perhaps I don't understand thine side of the situation." "Imagine someone kidnapped you, and then stripped you of everything." sighed Cade as he began his lecture on why he believed Omni needed to be put down like a bad dog for what he had done to them. "Oh wait, you don't have to. You and I both experienced the same thing, myself more than once. As this has happened to me before, I am not amused about it. Therefore, something has to be done about that arrogant prick. " What he would not give for a mech suit, or powered armor for himself. Really he needed a lot of technology for himself so that he could protect himself.